When we rock to sleep at night, we sing songs. The songs must be in the same order every night without skipping any verses, and we must end with counting to 10, and then to 20. Every night. The same ritual. She is a child of routine. 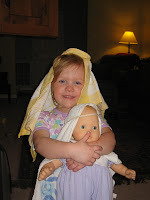 Another one of her favorite songs is "Jesus Loves the Little Children." We used to sing the first verse only, but she must have learned the second verse at church. One day, after we had finished singing the first verse, Laura demanded, "Sing Jesus in diapers!" We couldn't figure out what she was talking about. Then we realized she was referring to the song's second verse - "Jesus DIED FOR all the children..."
That is one I would have to think about too. I love it when these kids sing. Anna does not like to sing "Jesus Loves me" anymore. I think we wore it out. Makes my heart sad to think she is growing up too fast. Cute photo of the wisemen! Sara, I also heard her asking to sing about Jesus in diapers! Needless to say, I did not get it either! That is hysterically funny. And I'm sure it is only the beginning of funny phrases. Won't it be so much fun to tell her about these phrases as she gets bigger? !